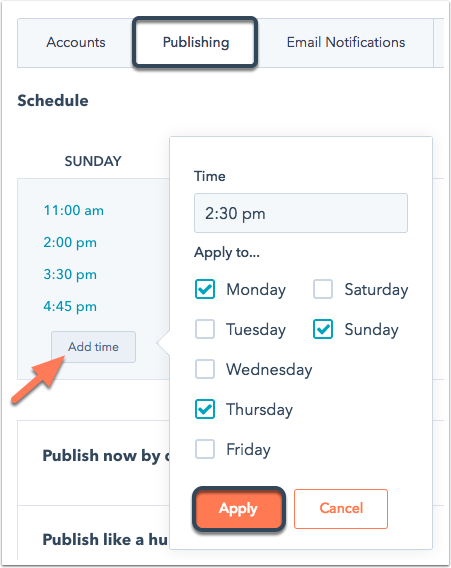 HubSpot's social tool gives you the option to post social posts immediately, at a custom time, or on a default publishing schedule. In addition, you can create a custom publishing schedule to easily schedule your social posts based on when you anticipate getting the most engagement. Please note: ensure that your account time zone is correct before determining the optimal times to schedule your social posts or setting up your custom social publishing schedule. First, spend a few weeks gathering data around what times of day your social posts generate the most clicks and interactions. In the upper left of the table, leave the account filter set to All accounts and campaign filter set to All campaigns. At the top of the table, click the Clicks column header to sort your published social posts by the number of clicks received. Review the Time column to see the date and time each post was published. Write down the publish times of the 10 most frequently clicked posts to determine what time of day works best. You can also choose to factor in social posts that generated high interactions, such as likes and comments. If you do, write down the publish times of the 10 social posts with the most interactions and clicks instead. Hover over a day you want to add a publish time to, then click Add time. In the dialog box, reference the publish times previously written down and select a time and any additional days of the week you want this time to apply to. When you're done, click Apply. To delete an existing publish time, hover over the time and click the trash can icon delete. To vary your publish times so that posts are published within 10 minutes (before or after) of the scheduled time, click to toggle the Publish like a human switch on.